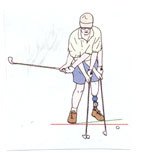 Golf is one of the most popular sports enjoyed by amputees of all ages, levels of amputation and functional abilities. Few recreational activities encourage people to get outside, compete within their comfort level, and enjoy social exchange with friends the way golf does. Interestingly, golf is also one of the most beneficial activities for improving balance, coordination, range of motion, strength and endurance. In many ways, golf is the perfect rehabilitation therapy. Putting - There are countless aspects to putting, from stance to club selection. For the purpose of this exercise, the classic pendulum-type stroke has been selected. Stance: Set up with a comfortable, wide stance; bend your knees a little as though you were going to sit. For AK amputees, the artificial knee is straight with the sound limb slightly flexed, if possible. Feel the weight over the centre of your feet, with a little more weight on the front foot. You should feel very secure and balanced over both feet. Your upper arms should rest lightly on your rib cage, and your forward eye should be directly over the ball. Stroke: Your hands, arms and shoulders all work together, creating a pendulum-type stroke. Your shoulders and arms create a triangle that moves an equal distance on both the backswing and the through swing, with the head remaining still at all times. Prosthetic Foot: You should feel the points of the heel, little toe and great toe on the prosthetic foot. This will help balance the weight over the foot. Start with equal weight distribution between both feet, and then move the weight slightly toward the forward foot, whether it is the prosthetic foot or sound foot. From your putting stance, shift your weight side to side slowly and gently from one foot to another. Find the point where your weight is equally distributed between both legs. Again, from your putting stance with the weight equally distributed, shift your weight from your heels to your toes. Focus on the artificial foot, sensing when you are on the heel and then on the toes. Then, find the point where your weight is equally distributed. With the weight equally distributed, now move the weight just slightly to the front foot. Bring your hands together, fingers straight, trunk and knees flexed. Keep your head still and move your shoulders, arms and hands together in a stroking motion, keeping your head still. Feel the stability of your feet, legs and pelvis. Now take a putter and start with short three-foot putts and progress to longer and longer putts. Maintain the same swing, focusing on a stable base within the lower body. Benefits – Besides helping your putting game, you are working on prosthetic weight-bearing, developing a sense of how your weight is distributed over your artificial foot, connecting your body and foot to the ground, and challenging your standing balance. You are also differentiating your trunk from the pelvis, which will aid in arm swing during walking. Chipping and Pitching – Getting on the green and close to the hole can reduce your score dramatically. Chipping and pitching is all about balance and repeating the same stance and stroke over and over again. Stance: Use a narrow open stance, where your feet are positioned fairly closely together. The forward foot is slightly back and your body is aligned slightly left of the target. The ball is positioned back toward your back foot, with a fair amount of weight on your forward side. Knees are slightly flexed, with your back straight and rear end out a little. You’ll probably feel as if you’re off balance but hold the position. Stroke: Your hands move ahead of the ball, wrists firm (no bending) with your weight moving toward the forward leg. The distance of the backswing and through swing dictates the distance you want the ball to go. Both movements are usually equal in distance. A short chip requires only a short back and through swing, whereas if you want the ball to fly farther to reach the green, a more complete stroke is required, along with a little wider base with your feet. Prosthetic Foot: Getting the weight down into the artificial foot is essential for consistently successful chipping and pitching. A prosthetic foot that permits vertical and rotational shock absorption can make this stroke much smoother and more comfortable, especially when the artificial limb is forward. From the narrow stance position used for chipping, hold your hands in a golf grip position and practice short strokes. Emphasis should be focused on getting the weight down into the forward leg. The trick is maintaining the balance over the forward leg at the end of the stroke. Once comfortable with motion and weight shifting without using a golf club, use a sand wedge and perform the same motion. Again, hold your finished position with your body weight well forward. Since golf courses are neither flat nor firm, practice the same stroke with a golf club, placing a foam cushion under both feet. Hold the finished position. As your comfort level improves, take a half swing, a three-quarter and finally a full swing. As you increase your swing, widen your stance. Focus on the weight shift and holding the finished position. Benefits – With practice, you will be able to get the ball in a better position to reduce the number of putting strokes. Additionally, you will improve weight shifting, stability and balance over the artificial limb in various positions. The strength in your legs, as well as your overall balance, will increase, especially as you take bigger swings. Stance: As in the illustration, feet should be shoulder width apart and turned outward slightly. Bend your knees slightly until you feel your weight over the centre of your feet. AK amputees will need to keep their artificial knee straight and, as a result, the sound knee will be straighter also. Stick your rear end out a little, keeping your lower back straight and your chin up. Backswing – Make a smooth, one piece turn, moving the club, hands, arms, chest and shoulders together, sweeping the club head back low with a full and wide swing. Keep the weight on the inside of your back foot with your front foot firmly on the ground. Downswing – The lower body initiates the movement as the body unwinds, and the hands stay soft as the club head moves through the ball. Your body weight shifts smoothly from the rear foot to the front foot. Your body must be encouraged to rotate all the way through the shot, with the majority of the weight finishing over the front leg. Prosthetic Foot: As the magnitude of the golf swing increases, a sense of where your artificial foot is needs to increase. The more you can feel where your weight is distributed over the prosthetic foot, the better is your balance and swing control. Also, the greater the forces that are generated throughout the artificial limb, the more a shock absorber or torsion-control device will reduce the forces and permit greater motion and comfort. 1. Take your stance position. Then start by taking a half-swing and progress to a three-quarter swing and then a full swing. Focus on the weight shift between your feet. Keep the weight inside your back foot during the backswing, and allow the weight to move to your forward foot during follow through. Hold the follow through position for a couple of seconds. 2. To help keep the weight distributed equally on the inside of both feet, place a half-buried golf ball under the outside border of each foot. 3. To maintain pelvic stability, place a ball between your knees. Take a swing, keeping the ball in place. This will help maintain a stable base and prevent over-shifting. 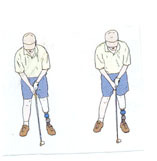 Benefits: Maintaining a stable base not only improves your golf game, but will improve your prosthetic control, with everyday activities and walking. Controlling both the backswing and follow through will build deceleratory strength throughout both lower limbs, especially within the socket. As club head speed improves, the need for greater strength and balance will also increase. Being able to control all the movements in an activity as complex as a golf swing will make everyday activities seem simple. *Reprinted from "First Step" by permission of Robert S Gailey PT PhD and the Amputee Coalition of America.